Lisa Kelly is half Danish, half deaf. 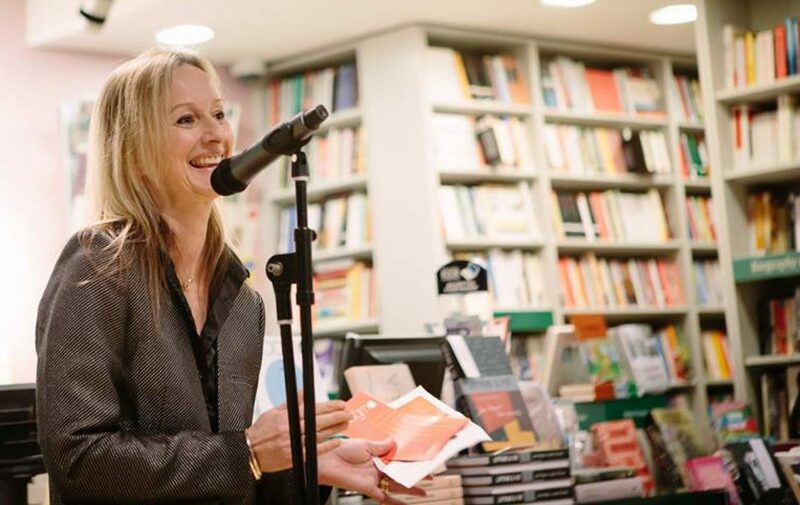 Her pamphlet Bloodhound is published by Hearing Eye and she is a regular host of poetry evenings at the Torriano Meeting House, London. She has an MA in Creative Writing with Distinction from Lancaster University, and is the Chair of Magma Poetry. And the varied, sensitive but well controlled and intelligent in this collection certainly know how to enter a person’s psyche. Dannie Abse once said that he wanted to enter a poem and come out of it feeling differently; and this collection of poems from deaf and disabled poets do that to reader. There wasn’t one poem in the book that made me wonder why it has been included in this fine collection. None of the writers in this anthology feel sorry for themselves but they are ready to stand up and show the world what it is like to be partially hearing or to have a disability. All manners of disability are represented here including full or partial hearing loss, mental illness, blindness, other physical disabilities, illness and chronic pain. In between poems there are paragraphs from different writers who identify what it is like for them personally to have a disability and what they perceive it is like for others to see them. Cathy Bryant writes: ‘Disability informs my poetry because it is part of who I am and how I live my life and perceive the world and how the world sees me. For example, when an article on writing suggests “going for a walk and observing nature,” they assume that the reader can see and walk’. In “Ms Bryant is Dangerously Delusional from Statements said or written about me and/or my partner Keir” written by Catherine Bryant, the reader enters the world of someone whose life and control of the everyday is taken over by the professionals. I found it a very upsetting poem to read but it is one worthwhile to dwell on as it made me question my own thoughts and sensibilities. That is why it should be read and considered. It is an honest and brave poem. If she can write a letter then she’s not that disabled. In spite of all her disabilities she was able to visit Heptonstall Graveyard – to visit a grave. You seldom see the curtains open. The main body of the book is divided into sections: Bodies, Rules, Maps, Dreams and Legends. upon it was not ‘b’ but ‘d’. Damn! Kelly writes of her work: ‘Ellen McGrath Smith’s essay in “Beauty is a Verb”, “Hearing a Pear: The Poetry Reading on a New Frequency”, helped me approach my mishearing as something that can generate creativity, word tag and word play being a crucial part of how I compose.’ I warm to this idea of creative play which is surely what writing is about but Kelly has turned her disability into an advantage. The ability to do this is a small compensation for the loss of haring in one ear. This book is far more than a slim collection of poems. It is an anthology of poetry, essays, photos and valuable links to on-line videos and audio recordings. The book shows us another world of literature that needs further exploring. It is an exceptional piece of work for the poems are well-crafted, informative, intelligent, heart-rendering, angry, happy and sad. It is a remarkable collection written by known and less-known voices but all voices certainly deserve to be heard. Congratulations to the editors and Nine Arches Press for taking on this fine work and bringing it to the attention of us all. my heart as I edge down concrete stairs. Very happy to have ‘When I Lose This Tooth, I’ll Age Twenty Years in Half an Hour’ on Amaryllis website today. but am cautious about rhyming tooth with truth. When I lose this tooth, I’ll age twenty years in half an hour. When I lose this tooth, I’ll age twenty years in half a second. just as there will be no tooth, there will be no poem. Lisa Kelly is half Danish and half deaf. She is Chair of Magma Poetry and co-edited ‘The Conversation Issue’ and ‘The Deaf Issue’. She hosts poetry evenings at the Torriano Meeting House, London. 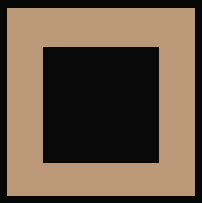 Her pamphlet Bloodhoundis published by Hearing Eye and work has appeared in PN Review, Ambit, Antiphon, The Spectator, South Bank Poetry, The Rialto, Prole, Urthona, Brittle Star and Tears in the Fence. 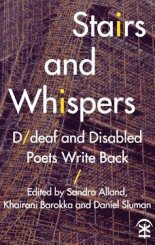 Anthologies include Asterism; and Stairs and Whispers: D/deaf and Disabled Poets Write Back. A selection of poems feature in Carcanet’s New Poetries VII. Her pamphlet, Philip Levine’s Good Ear (Stonewood Press) is forthcoming 2018. Two Rather Lovely Reviews ! The London Review Bookshop, Bloomsbury, 7pm. Wine glasses clatter as they are placed on the floor, animated conversation fills the air, friends are greeted, coats shrugged off. Michael Schmidt, the founder and managing director of Carcanet, steps before the audience to introduce the four poets who will be reading tonight as part of the launch of New Poetries VII, an anthology that brings together what Michael, in the Introduction to the book, calls ‘a chine, a prickle, a surfeit, a blessing – a group – of new poets’. 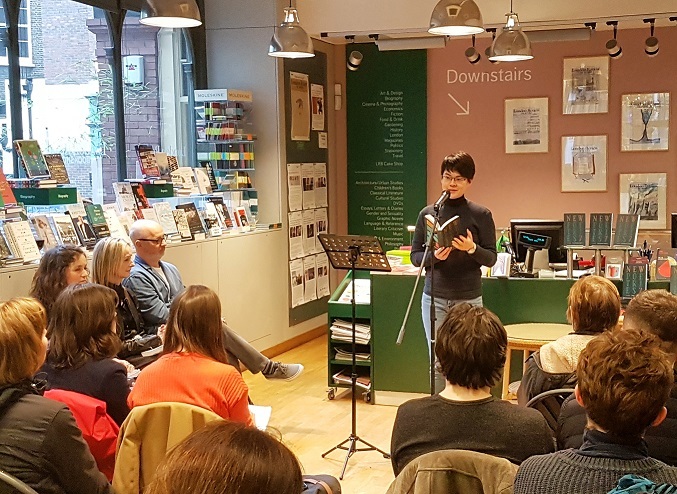 He is delighted to be in the London Review Bookshop, one of his ‘favourite’ bookshops in the city, and to be introducing the seventh New Poetries, a series that is also one of his ‘favourites’. Many Carcanet poets, he notes, began their writing careers in the anthology, and have gone on to ‘star on our list’, including Sinéad Morrissey, Kei Miller, and Vahni Capildeo. These poets, Michael affirms, ‘help me forward’. The reading ends with thanks to the London Review Bookshop, a clinking of wine glasses, and the steady rise of conversation in the air. Magma in partnership with The Cinema Museum for the Launch of M71, The Film Issue – what a lovely venue!